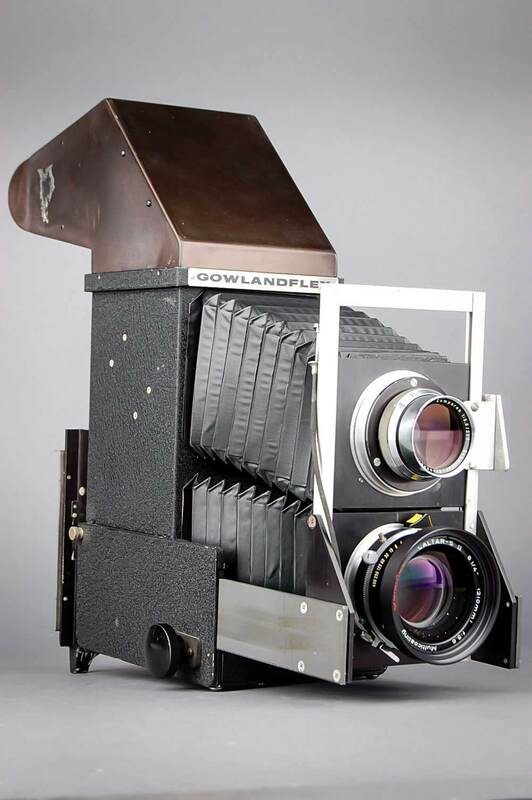 The ebay ad tells the truth, since this camera is the legendary Gowlandflex, a 5×4 – large format – twin lens reflex! 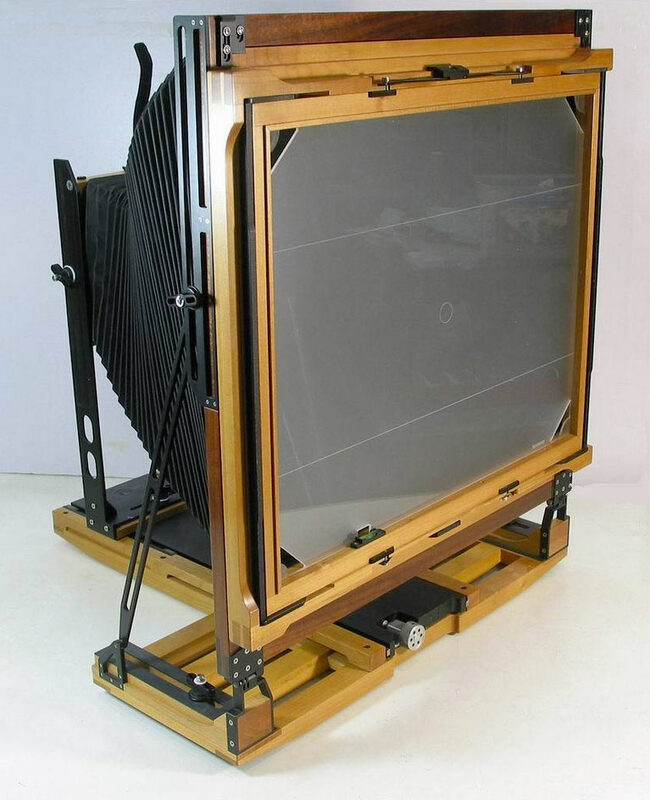 All other TLR cameras such as the Rolleiflex are medium format using 120 film to make 21/4 inch square negatives. This one is a giant. 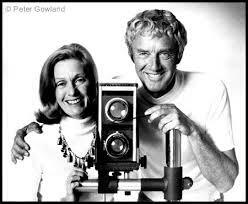 Its inventor, Peter Gowland, was well-known, and the camera did find a small market. 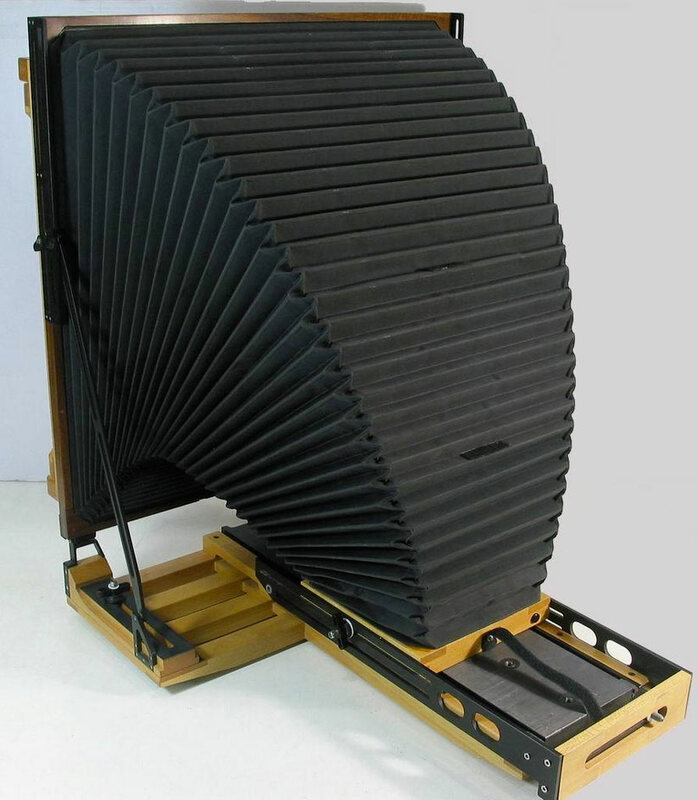 There was even an 8×10 model version which stood almost three feet tall! 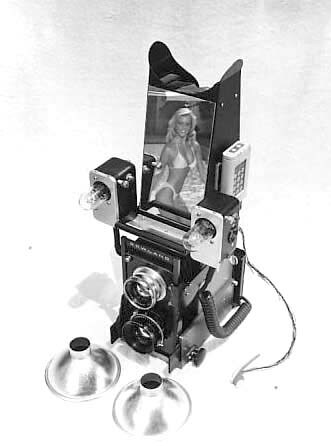 Advertisements for the unwieldy camera appeared in popular photography magazines around 1960, and 600 were sold. They are currently a collector’s item, one is owned by Annie Liebovitz. 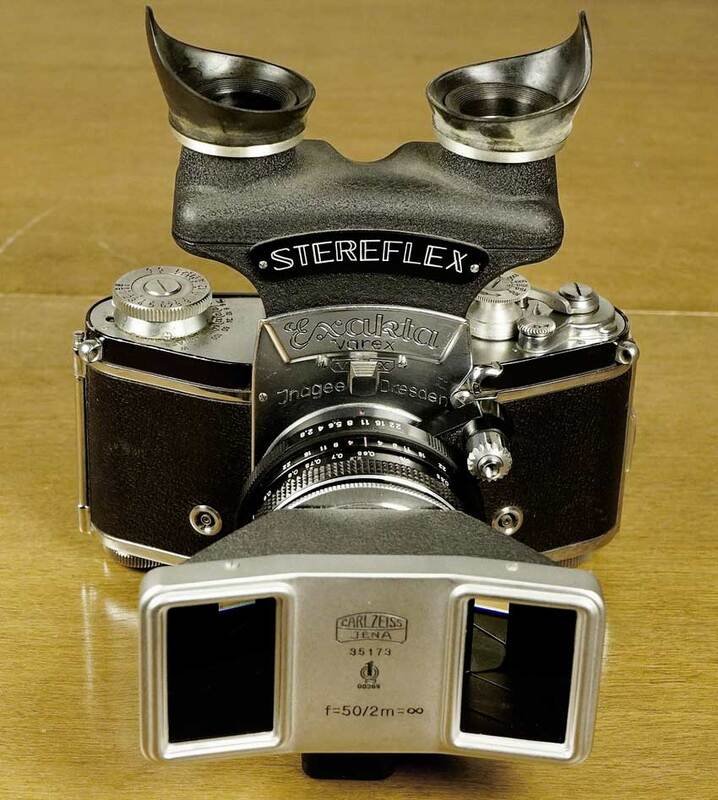 The website for the Gowlandflex shows different models and accessories, all of which are unique and original. 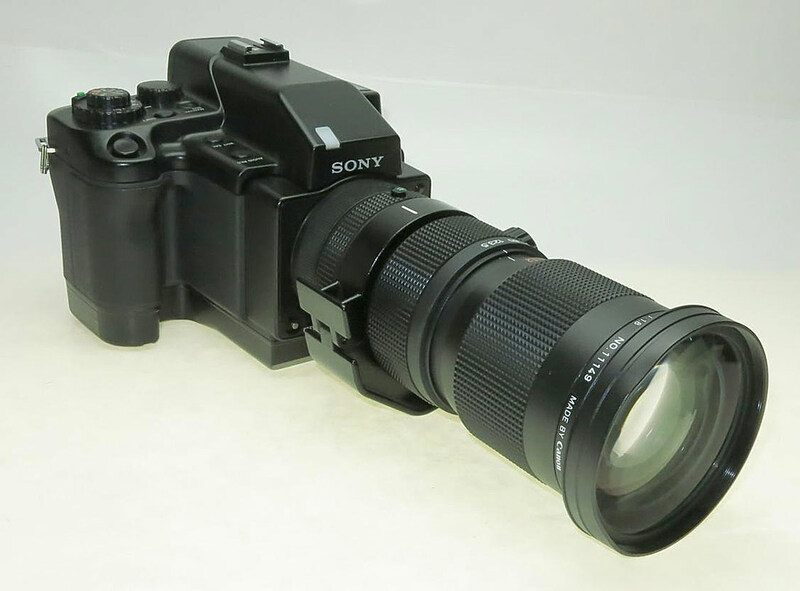 It’s worth a look, since this is one of the most unusual camera stories of all. This model was used by Gowland himself and had a mirror fixed to the front so the model could adjust her pose. The story of its inventor is a strange one. Peter Gowland was a celebrity glamour and pinup photographer during the 1950s and 60s, always seen shooting on beaches with cheesy models. He was handsome and well-built in that Southern California way, and his high-wattage smile must have opened doors for him. He was the son of actor Gibson Gowland who appeared in D.W. Griffith’s Birth of a Nation and Intolerance, and starred as the villain McTeague in Erich von Stroheim‘s 1924 masterpiece Greed. He was not a star, but you wouldn’t mind if it meant having those titles on your CV. His son Peter also appeared in several major films, including, unbelievably, Citizen Kane. Who could make this up? Peter Gowland with his wife and business partner Alice Adams. 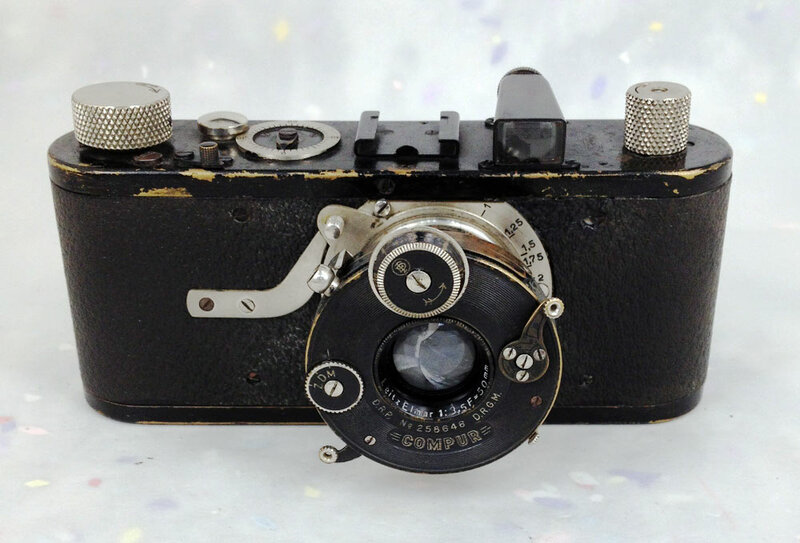 A rare early Leica model B is being auctioned on ebay, bids start at $36,500. 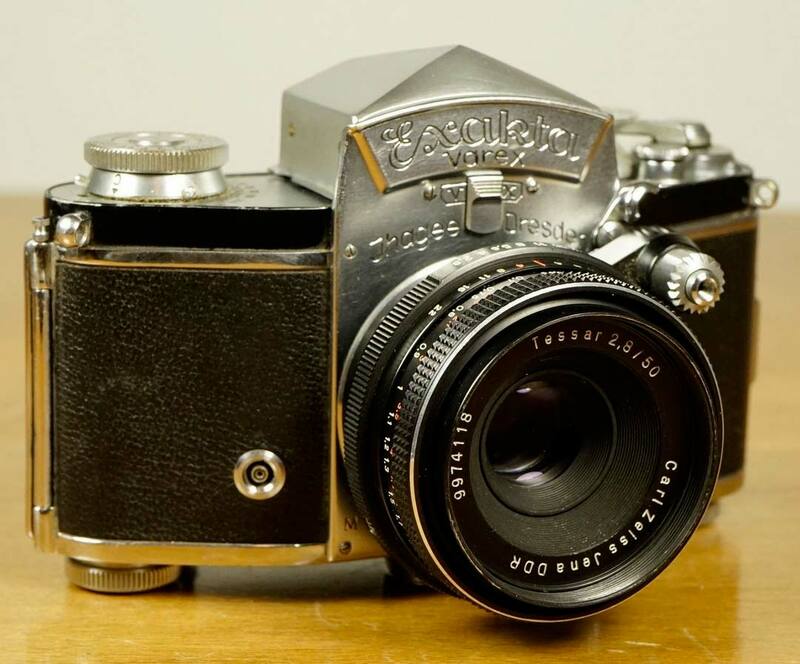 The camera was made in 1928 and is thus a fossil from the early years of 35mm still photography. 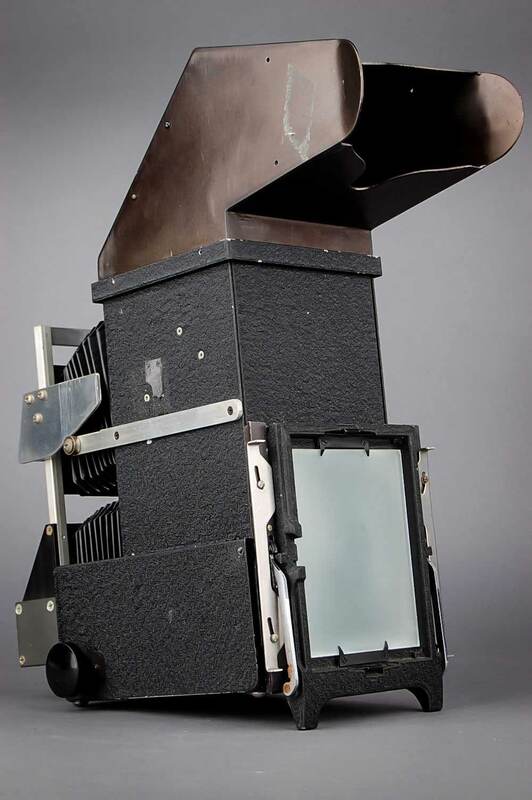 Compare it to the giant Anthony Climax camera from my other ebay post, where the studio stand also dates from 1928. You can see from this contrast the revolution that was happening in photography. The Anthony would require strong men to move it, the Leica fits in the palm of your hand. It’s an impressive technical gadget, a boffin’s camera. 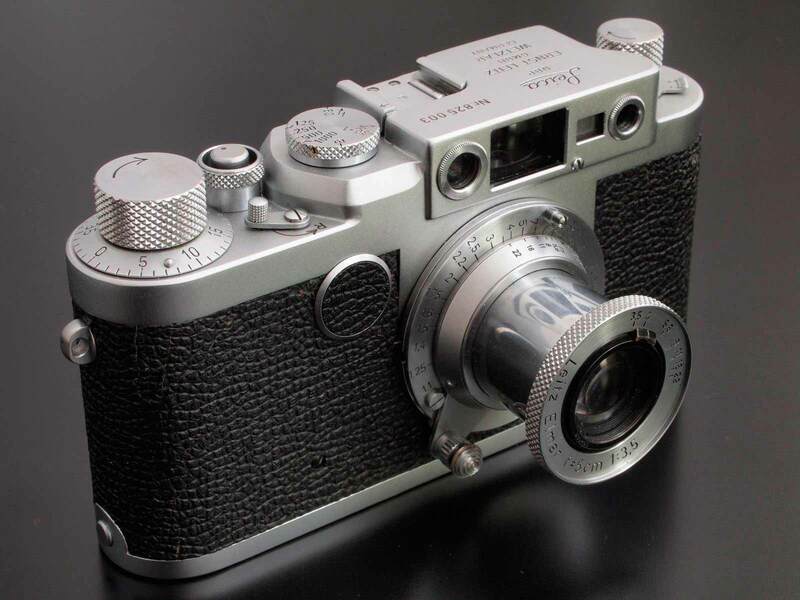 Industrial design had not yet arrived at Leica; later designs where smoother and more ergonomic, sleek accessories for the well off. This one is a naked machine, it’s functioning parts indecently exposed. No provenance is mentioned on ebay but you can imagine an intrepid photo-journalist using it in the early days of the picture magazines. 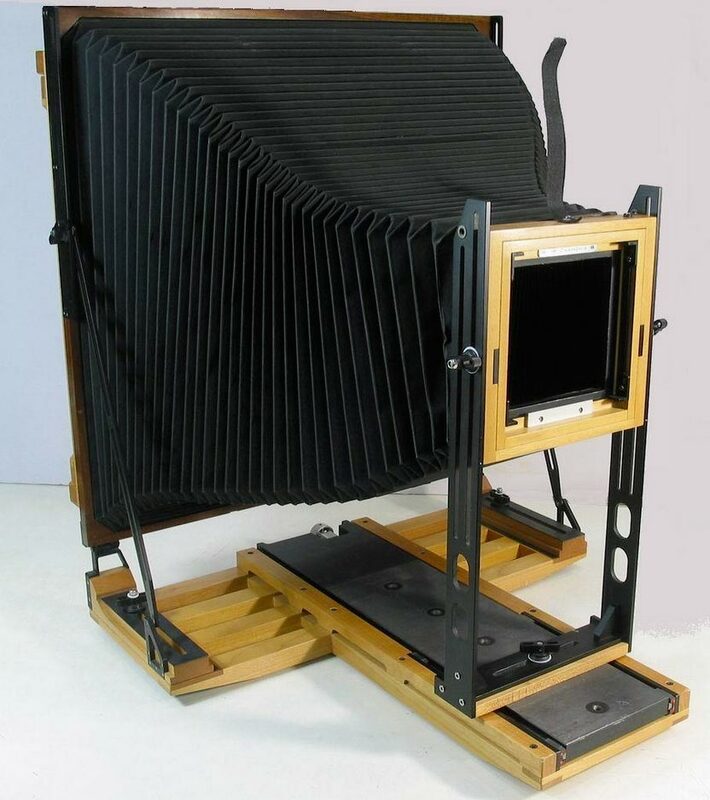 Certainly the camera has not been sitting on a shelf all its long life, it has plenty of signs of use. Oddly, in the case of Leica, that only increases its romance and hence its value, a measure of how mythic these cameras have become.